I have about ten square feet of gardening space. It happens to be next to my pool, hence the need for containers. For everything. Because of the pervasive shade, we don’t get much sunlight in our windows either. 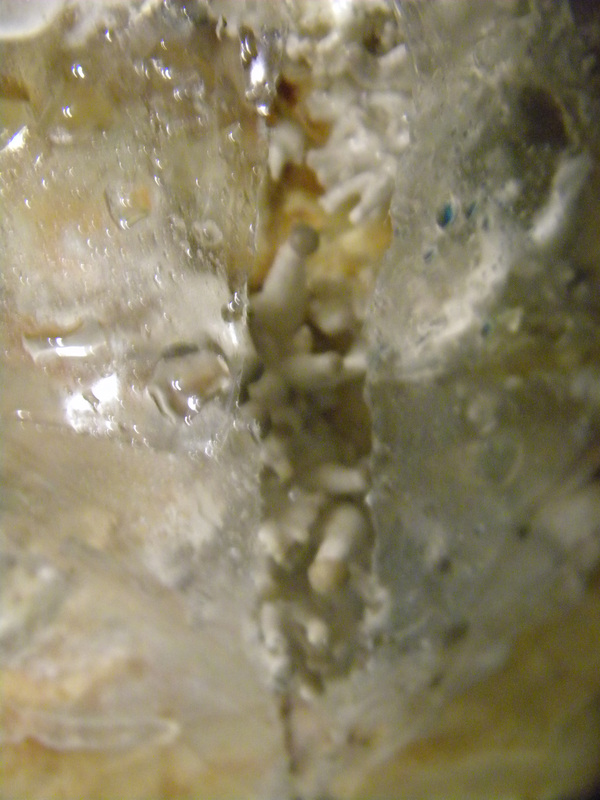 Enough for filtered light, sure – enough to grow? Questionable. 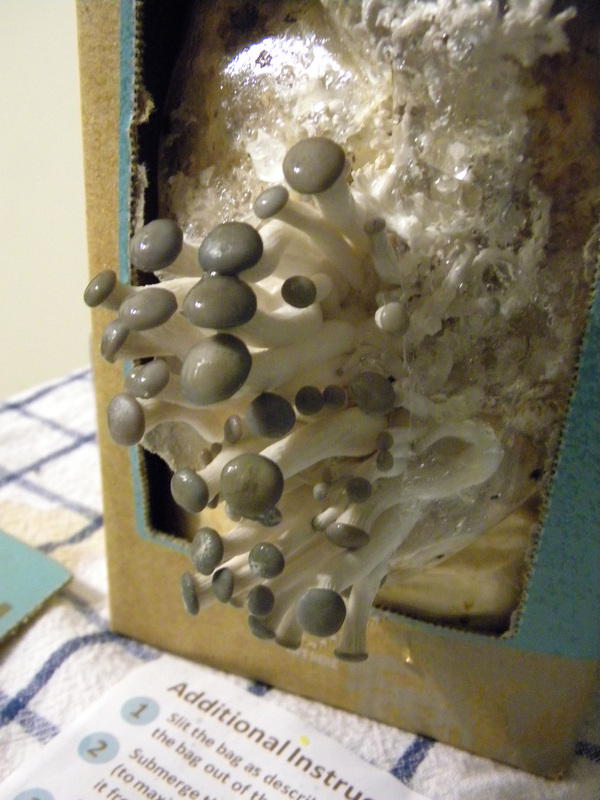 One thing we can grow though – shrooms. They love shade! If we were to stay here long term, I would think about getting plugs and making a mushroom garden. 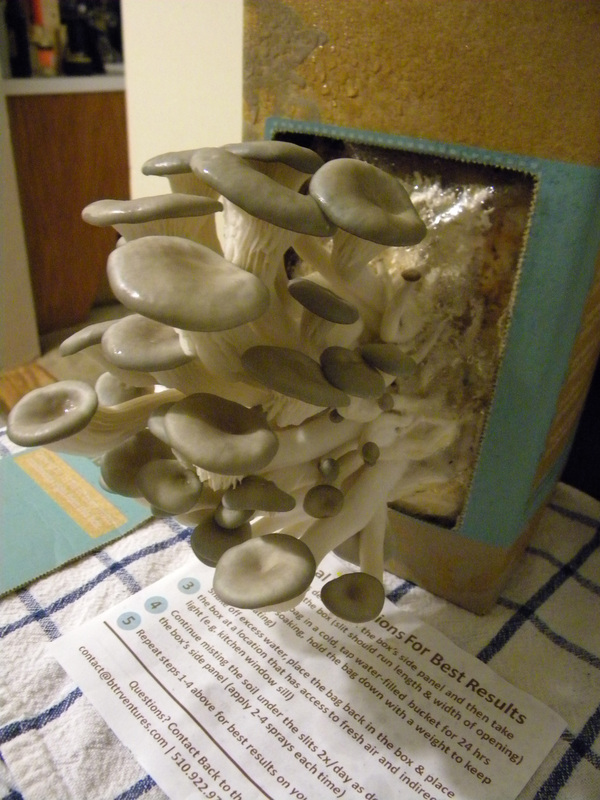 It seems easy enough – get a few logs, do some inoculating, wait a while, ta-da mushrooms. Of course its more complicated than that, but they seem to do fairly well if you ignore them. My kind of garden. Maybe someday. Until then? Its Back to the Roots. Have you heard of them? They’re everywhere these days. Not only do they encourage urban food production, they partner with Peet’s Coffee to make a sustainable, eco-friendly product out of coffee grounds that would otherwise go to waste. What’s not to like? Day 5: Finally something to show for daily misting. Day 6: Things move fast from here. What can you do with fresh mushrooms? What can’t you do with fresh mushrooms? My first batch went into risotto. The next one was dry roasted with garlic – used as a pizza topping and a tapa. Roasted mushrooms + garlic + thyme + lots of extra virgin Spanish olive oil + grilled bread = amazing. You should try it. Oh, you can. Just leave a comment here telling me about your favorite way to shroom. I know I really need to get around to pickling some. Entries to close Friday August 26th at 11:59pm eastern time. Disclaimer: I was the lucky winner of a BTTR kit from Eating Rules. They did not sponsor this post. All the words are my own. 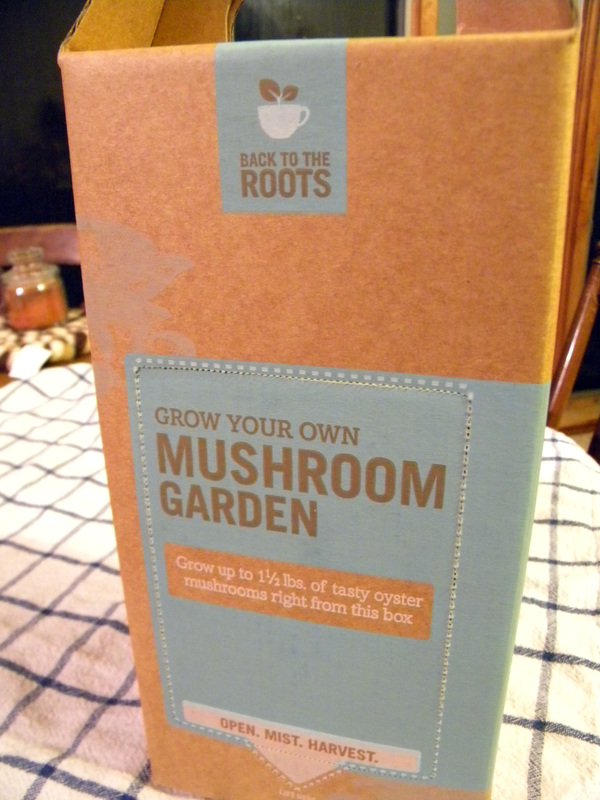 I am giving away a mushroom kit out of my own budget. 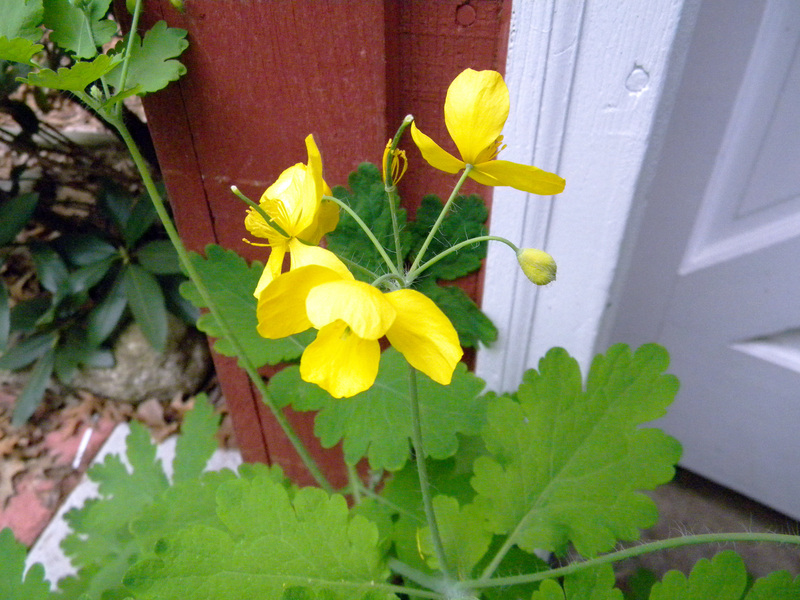 This entry was posted in gardening, giveaways on August 20, 2011 by Kate @ Snowflake Kitchen. There’s been a lot of stirring in the garden. Almost everything is planted in its final resting place and I am very excited about not having to pot things up anymore. I am currently on the hunt for bigger containers because I actually ran out. I found a fertilizer that works and I no longer need to worry about frost. Finally things are moving along! The tomatoes are doing well. I think I actually grew too many, so I’ve been trying to pawn them off on friends and at our local swap but to no avail. 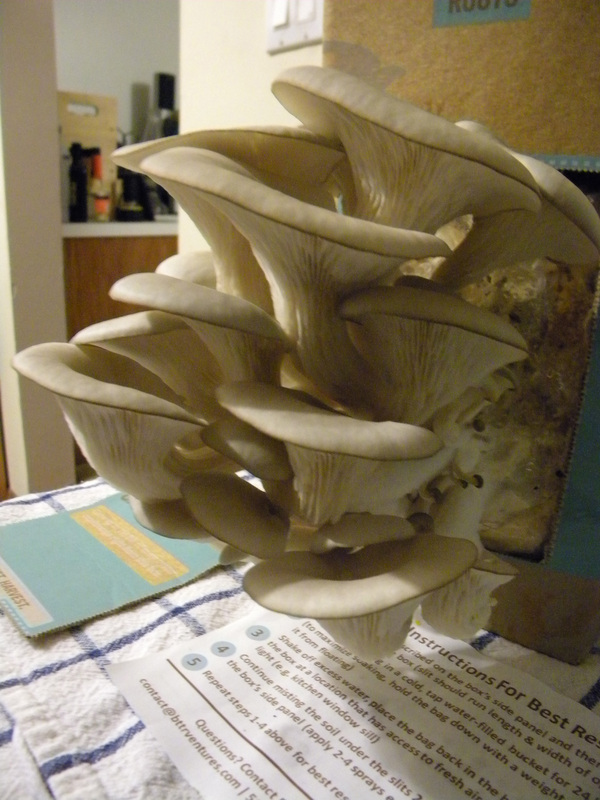 I grew Baker Creek’s Riesenstraube this year and it has been absolutely prolific. I think I have like six of them – which is crazy for a container garden. 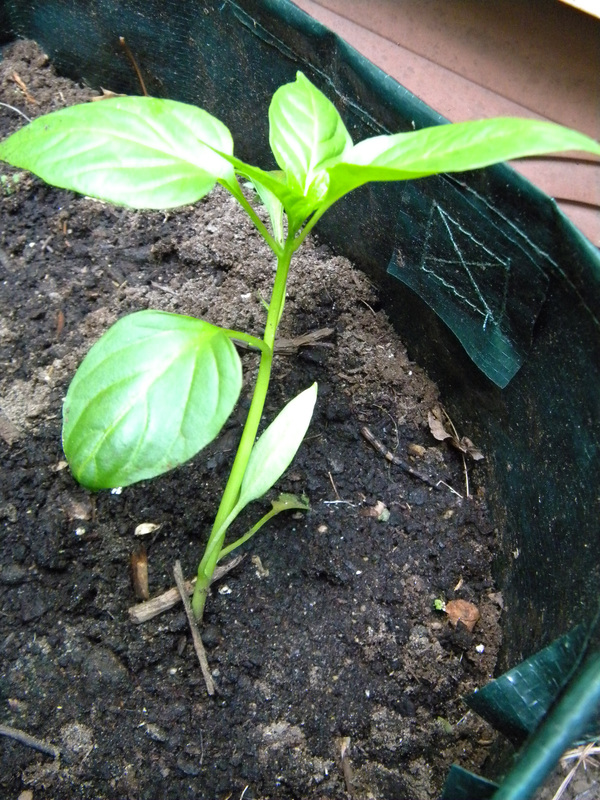 I am growing a few kinds of peppers, but I am most excited about my Pimientos de Padrón. I dont know if they’re particularly missing the Spanish medioambiente but they seem to be alright. When flash fried, these little beauties are my favorite tapa ever. I hope we get some hotter weather so they perk up a bit, but its early yet. Slugs killed my tomatillo hopes last year before anything could happen. While I am still engaged in epic battle with those nasty buggers, I seem to have the upper hand at the moment. 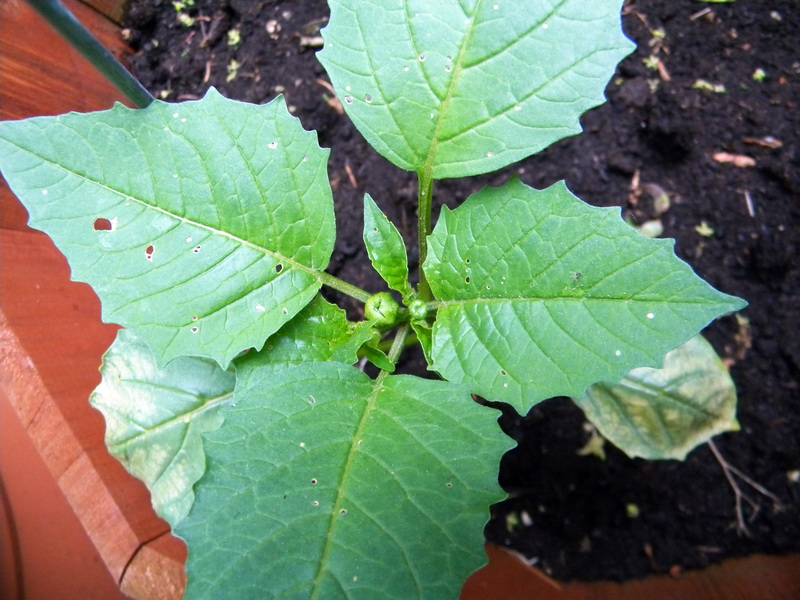 Its all worthwhile – I think the tomatillos are showing tiny tiny fruit! The theme of this year’s garden has been make do with little. 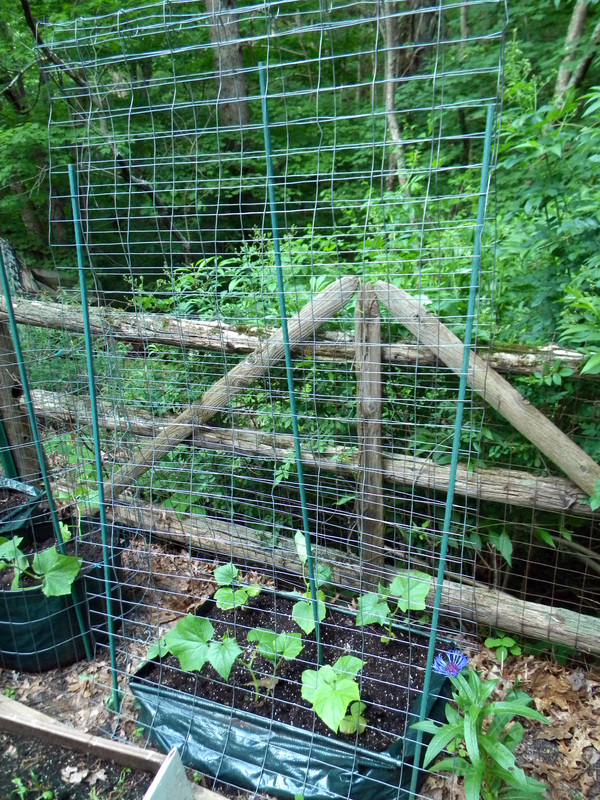 I wanted to buy a trellis for my Boston Pickling cucumbers after inspiration from a few of Re-Nest’s posts on vertical gardening. I happened to have a bunch of freecycled wire fence in our shed, and with some tomato cage stakes for support a makeshift trellis was born. Its not pretty, but its definitely functional and sturdy. I’m particularly proud of it, but it remains to be seen if it will work or not. Not pictured: two massive zucchini plants that I've been storing on the diving board of all places. So I don’t know if I can call it a garden anymore. I’ve been teased that its more of a microfarm at this point, and I’ve been forbidden from adding anything any closer to the pool. While its nowhere on the scale of Daphne’s Dandelions or Modern Victory Garden, but considering I have filled the most consistently sunny space on our property, I feel like its closer than you might think. So how does your June garden grow? This post was shared as part of this week’s Tuesday Garden Party at An Oregon Cottage. This entry was posted in gardening on June 6, 2011 by Kate @ Snowflake Kitchen. While I can’t boast about beautiful raised beds or fruiting plants or harvests yet, there has been a lot going on in the Snowflake Kitchen garden. First off, it wouldn’t be spring in Connecticut without lilacs. They really scream spring has arrived around these parts. They’re also sort of special in our family because my mom adores them. My parents used to have a lilac bush in their yard, but it is no more – I think it was eaten by an errant lawnmower or something. 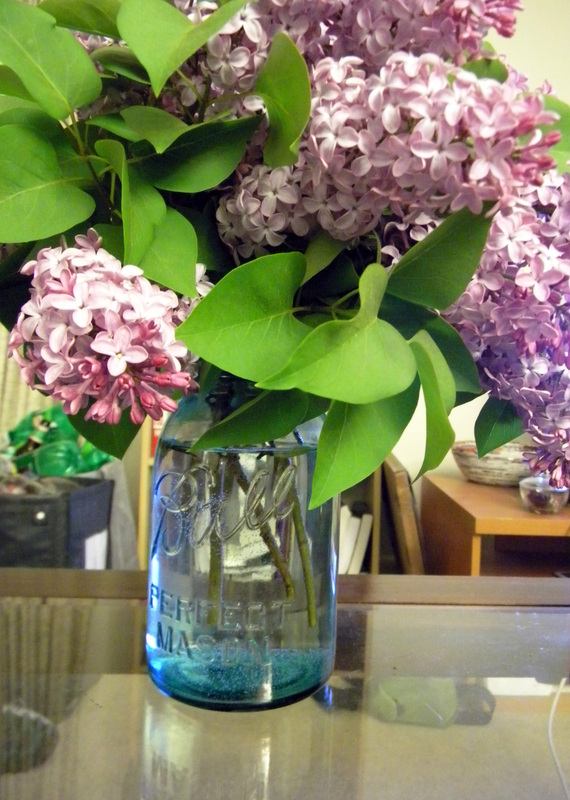 As such, late spring always turns into a hunt to find mom lilacs for Mother’s Day. Its tricky – while they do grow wild, you have to be very, very sure you don’t steal someone’s flowers. Lucky for me, there are some right near our house. So I can give mom her fill of the lilacs for the short while they are here. Even though its a weed, its a pretty weed. I might keep it for a little while. When we last spoke about gardening, I had just started the Daylight Machine. 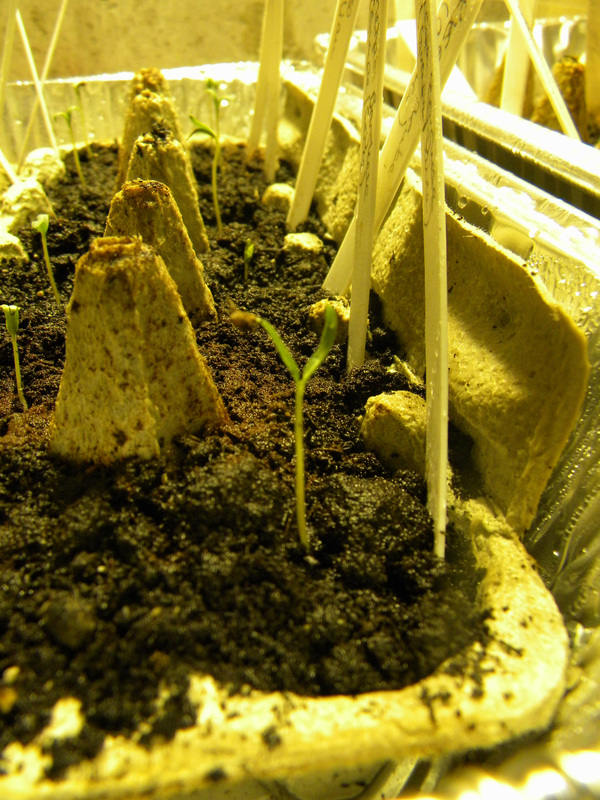 A few tomato seeds germinated … but quite a few didn’t. A combination of under- and over-watering to try to compensate for the dryness. I didn’t even think about it at the time – but we had a dehumidifier running nonstop in the basement. Once that was turned off, we finally figured out a system that works. One of the few of the first round that made it. Now it goes something like this: 1) Turn the light on for 18 hours, water from the bottom. 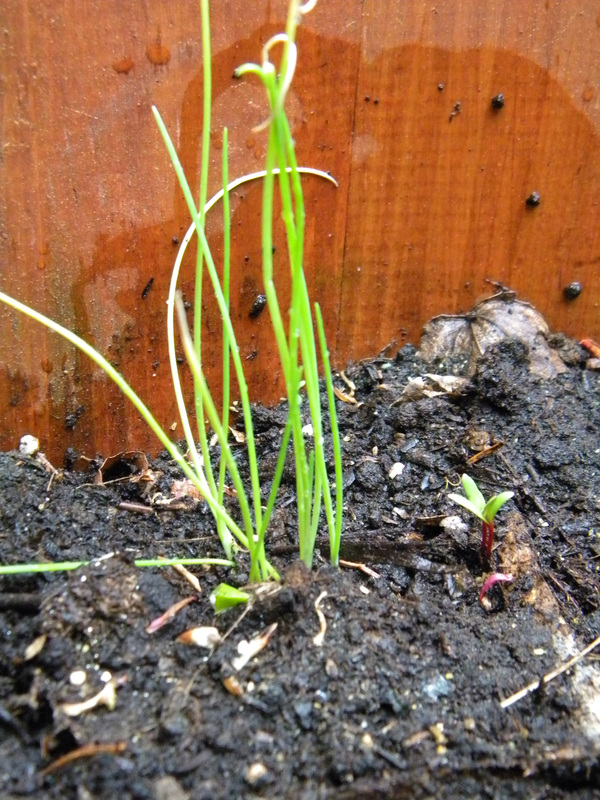 2) Come home, make sure the soil is moist – spray with mister bottle. 3) Just before bed, mist again and cover tomatoes and peppers with humidity dome. 4) Before leaving for work, take off the domes, turn on the light and begin anew. Anyway, the moral of this story is its a good thing seeds are cheap. I only wish I had started a bit earlier. Luckily, in the midst of my learning experience, I’ve had plenty of garden inspiration to go around. Not everyone is lucky enough to own beautiful tiered property in California, which is exactly why you want to check out the gorgeous shots of Shae’s garden. I adore her citrus trees in wine barrel planters – and she just recently added a limequat to the grove! Not going to happen in Connecticut – but maybe a dwarf (indoor) citrus or two will eventually make its way to our house. A little closer to home, Tigress just shared her new stonefruit orchard. Plums, cherries, apricots, and peaches – oh my! I also cant stop thinking about the aerial view Daphne’s Dandelions gorgeous raised beds. Someday! When we own our own home – hopefully within the next five-ish years or so. 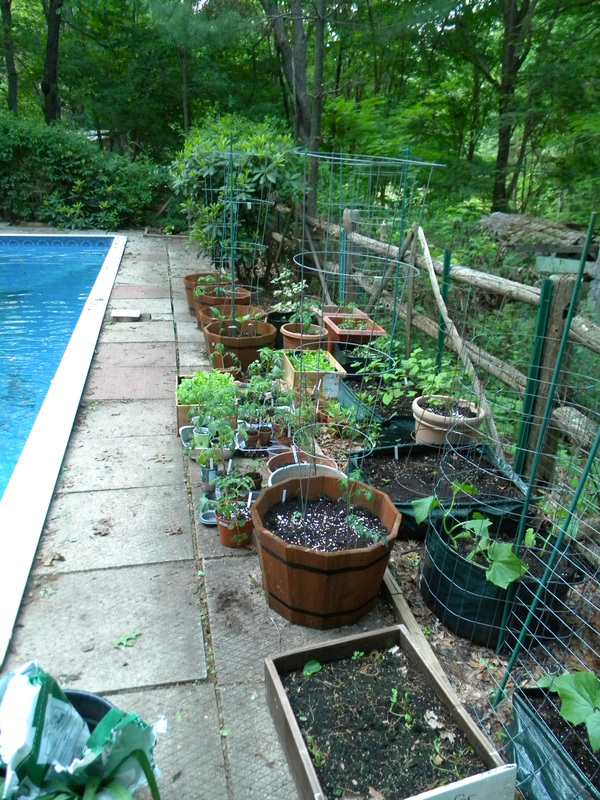 Anyway, back in Connecticut, I seeded another round of peppers and tomatoes, and added onions, cucumbers, zucchini, and basil. Most of them germinated (finally!) and they really started to take off. 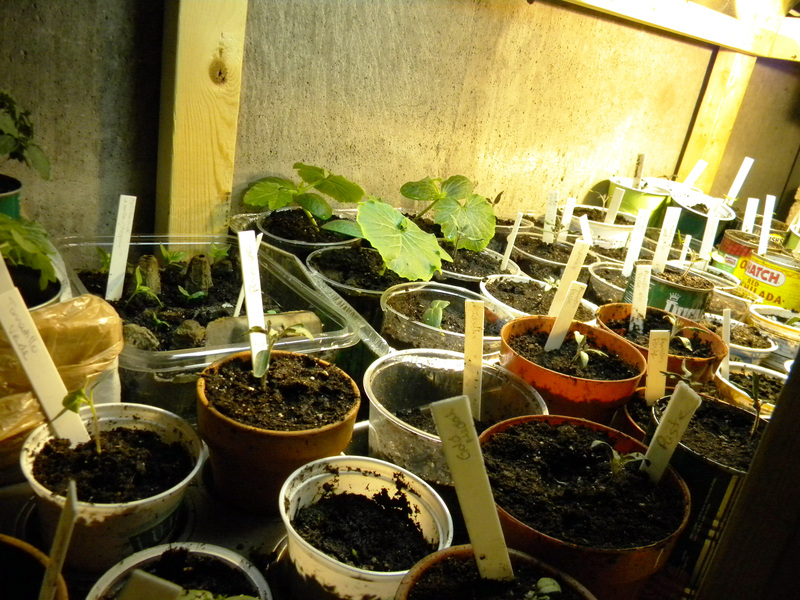 I spent hours potting up yesterday – I ran out of containers! We’ve saved all of our cans (beans, enchilada sauce, etc.) and small plastic cups (sour cream, yogurt, boyfriend’s chocolate pudding addiction) but it still didnt matter. 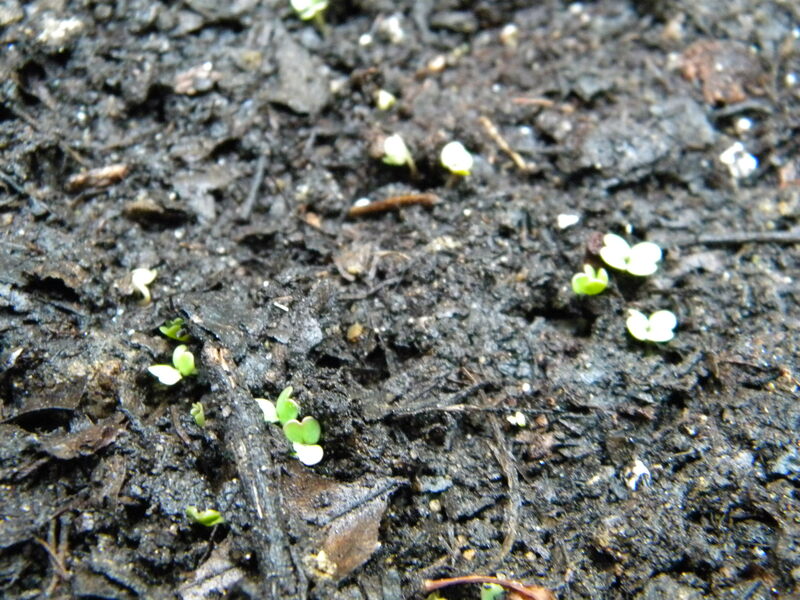 I have a small amount of basil seedlings still in egg cartons – they will have to wait until we get more containers. The good news is that they’re not ready to go outside yet, because its still fairly chilly at night. In another couple of weeks everything should be ready to be hardened off. 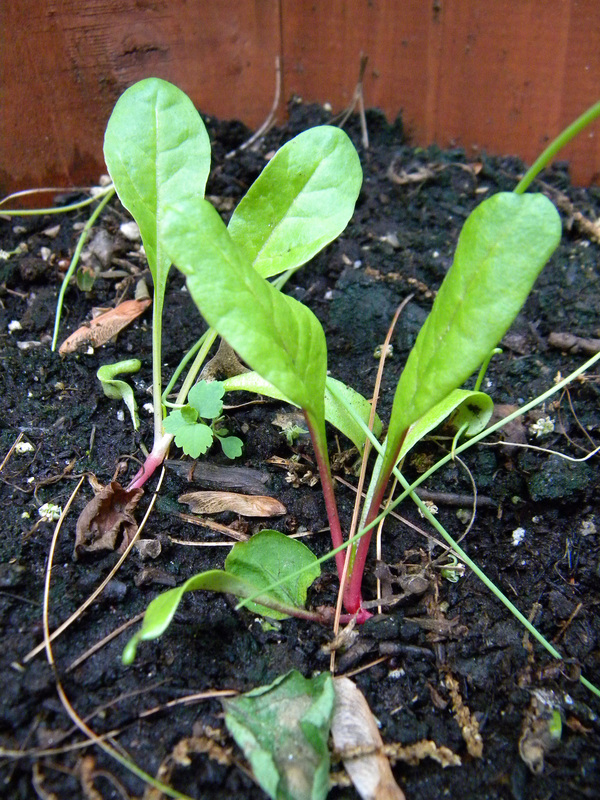 I love the baby chard - more keep popping up in the barrel planters every day. I also planted spinach in a drawer. That’s right – a drawer. (Nod to Kate’s dresser inspiration). Right next to my beans, which have failed to do much of anything yet. In defense of the beans, they did get jostled a bit when I had to bring them inside for an early May frost. Next door to them, I planted some greens (mustard and arugula) in repurposed wine crates, a la Life on the Balcony. Anyway, while its a lot less fun (I think) Joel and Dana’s parking space garden, its getting there. We’re about to have a straight week of rain – so it was good timing to get the greens outside. 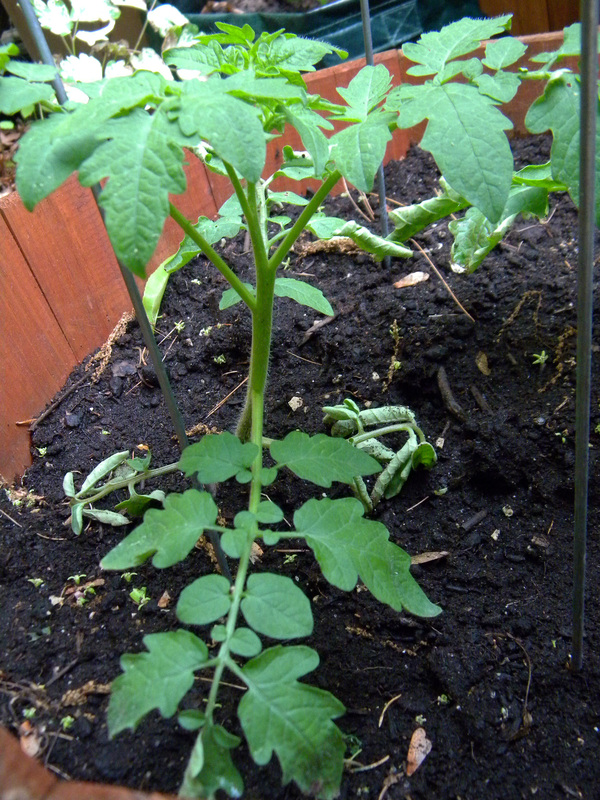 I’m itching to get the tomatoes out there, even though its way too cold still. Maybe in a couple of weeks. This entry was posted in gardening on May 15, 2011 by Kate @ Snowflake Kitchen. So this year is the first year I’ve started my garden from seed. 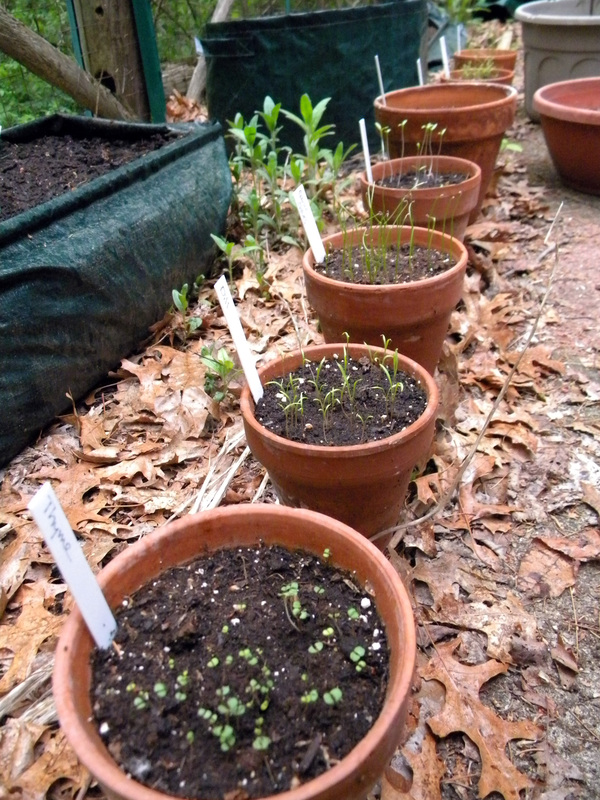 I’ve previously bought organic seedlings from my local garden store. At $3-5 each – while they are wonderful, they are nowhere near economical. So in 2011 when I found myself on a tighter budget than ever, it only made sense to start from scratch. The first problem: gorgeous catalogs from Comstock Ferre, Baker Creek, John Scheeper’s Kitchen Garden Seeds, Seed Savers Exchange and more. I’m sure every gardener suffers from I-want-one-of-everything-itis, but this was my first experience. I made a fairly conservative budget of $50. I even stuck to it – within $5. I also had to limit my choices of veg. We rent a home that has fairly limited garden space – so even though I want to grow prolific beds of squash and garlic… not going to happen this year. Our soil is also largely shaded… so most of the veg will be in one sunny spot in containers. I knew I wanted many kinds of tomatoes and peppers – easy to do in containers. I was gifted a few different kinds of beans and greens in a seed swap. The addition of a few herbs and some free onions completed the plan. The second problem: lack of knowledge. I will be the first to admit – I am a total n00b at this. I was not about to put blood, sweat and tears into this massive project, only to have it fail and THEN find out that I could have avoided the disaster. Luckily, Comstock Ferre does not just sell fantastic heirloom seeds, but they also happen to host workshops. And they happen to be only half an hour from my house. And they happened to have a seed starting workshop in mid-March. Sometimes things just work out. The third problem: equipment. You can spend hundreds of dollars on an indoor light setup. And – lets face it – this is New England, a.k.a. the land of the April Nor’easter. Needless to say, my plants aren’t going outside until six weeks from the last frost. I am hoping to get them outside around Memorial Day. 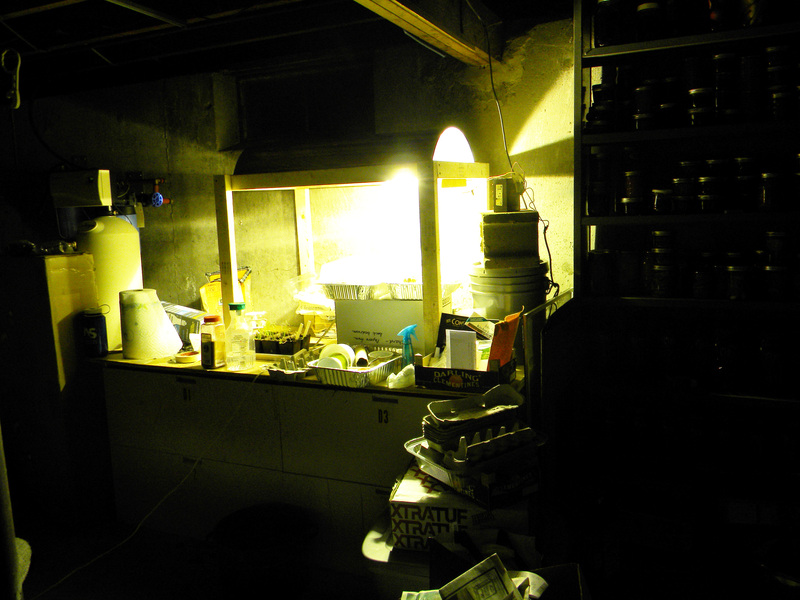 We have a fairly chilly basement/workshop, which was to be the place for our grand experiment. This is really the area of this where I am most proud – and most frugal. 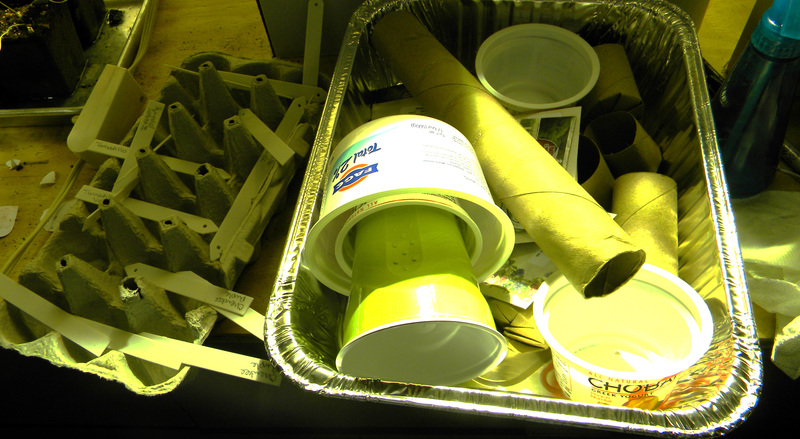 I saved egg cartons, cardboard tubes from toilet paper and paper towels, arugula and strawberry containers, and yogurt/sour cream containers for months. I spent $10 on disposable foil food containers with plastic lids to use as humidity domes for the tomatoes and peppers. I also found a vendor on eBay that built custom heating mats. Then there’s the light. Have I mentioned Señor SK is a tinkerer? (Did “workshop” give it away?) In his younger days, he built a projector to show movies on the side of his house for friends. He happened to have a metal halide fixture, transformer and capacitor leftover. 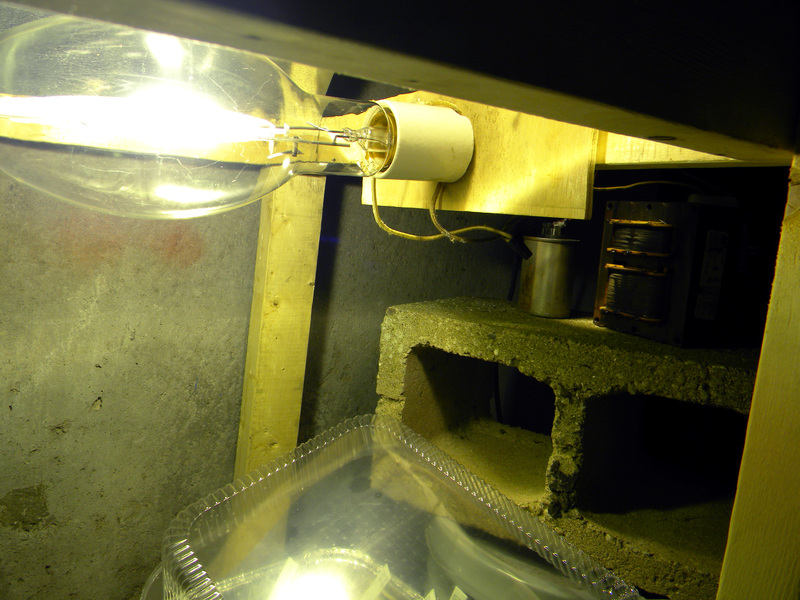 One trip to Home Depot for a new bulb, sheet metal, pine 2″ x 3″ x 8″s and soil and we were in business. It's not pretty, but its functional. Total Cost: Approximately $150. 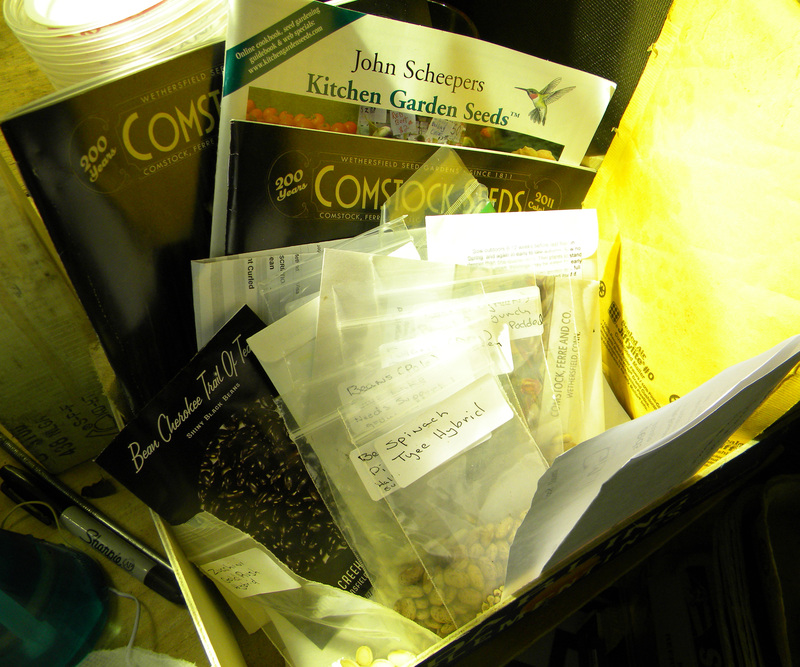 For initial outlay – all things we can use next year (except the cardboard and some of the seeds) – not bad. Oh, have I mentioned why we call it the Daylight Machine? Hard to capture in a picture, but this is with the regular lights off. Once the heating mat comes in, start the rest of the seeds. The only reason the tomatoes are thriving is that my parents lovingly lent me a heating pad to keep them warm in the interim. 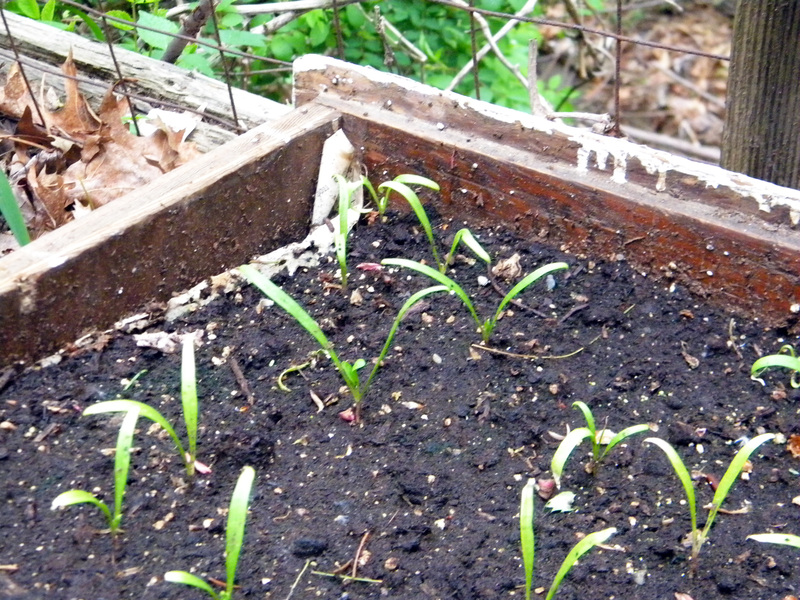 Planting: onions and chard in a whiskey barrel planter or two. Spinach in a dresser drawer bed. Peppers and basil and tomatoes and basil together in respective whiskey barrel planters. Dill and Cucumbers in the cucumber bed. Beans and Rosemary (and more Chard) planted in something I’m not quite sure of yet, but probably near the fence so they can use it to grow vertically. Speaking of beans – Comstock Ferre suggested rolling them in inoculant to grow. Really necessary? Thoughts? Anyway, welcome to my grand experiment. I’ll keep you posted. If anyone has any suggestions – feel free to chime in! This entry was posted in gardening on April 14, 2011 by Kate @ Snowflake Kitchen.